The world is gearing up for action on climate change and sustainable development. In 2016, CIFOR research showed how putting landscapes and forests at the fore can promote integrated action with better outcomes for human well-being, equity and the environment. The ‘landscape approach’ is gaining traction as a way to achieve the Sustainable Development Goals and meet global targets set under the Paris Agreement. The biodiversity-productivity relationship (BPR) is critical to our understanding of the global extinction crisis and its impact on ecosystems. Using ground-sourced data from 777,126 plots across 44 countries, this report reveals a globally consistent positive concave-down BPR, showing that continued biodiversity loss would result in an accelerating decline in forest productivity worldwide. New plantations can either cause deforestation by replacing natural forests, or avoid this by using previously cleared areas. The extent of these two situations is contested in tropical biodiversity hotspots where objective data are limited. This report seeks to bridge that gap by analyzing satellite imagery (1973-2015) to study the expansion of plantations. This systematic review examines the effects of land tenure recognition on agricultural productivity, income, investment and other relevant outcomes. The results indicate substantial productivity and income gains from land tenure recognition, although the gains differ markedly by region. The report concludes that there is a need for further research on inter-regional differences and on the role of customary tenure arrangements. Mangrove forests are potentially threatened by contemporary accelerated sea level rise (SLR). Several studies show that mangroves are able to adapt to SLR through vertical surface elevation change (SEC), however data are lacking, with often only surface accretion rate (SAR) data available. This report systematically reviews published studies of SEC and SAR from globally distributed monitoring sites using meta-analysis, and compares them with the Intergovernmental Panel on Climate Change Fifth Assessment Report (IPCC AR5) SLR scenarios. A commonality in the economics of happiness literature is that absolute income matters more for the subjective well being of people at low-income levels. This study uses a large sample of 6,973 rural households in 23 countries throughout Asia, Africa, and Latin America to test whether that theory holds true, and to analyze the existence of adaptation and social comparison effects on subjective wellbeing. Tree plantations play a controversial role in many nations’ efforts to balance goals for economic development, ecological conservation, and social justice. This report contributes to the debate by analyzing the socioeconomic impact of such plantations. Employing panel data regression techniques on a dataset collected in 180 municipal territories in Chile from 2001-2011, the study’s authors find that growth in plantation areas are associated with higher than average rates of poverty during this period. A living tradition in West Timor brings sweet rewards for forests and the community. This annual honey harvest in Indonesian Timor is important not only for the continuation of an ancient tradition, but for community-based landscape management. Discover this audio-photo essay featuring female voices from around the world: a charcoal producer in Zambia, a timber producer in Ecuador and a swidden farmer in Indonesia. CIFOR’s Gender Coordinator, Dr. Bimbika Sijapati Basnett, comments on the progress and unique challenges for women living and working in rural areas. Debates over forest loss generally focus on the extent to which industrial plantations are to blame: those in conservation charge plantations for the destruction of forests, while companies argue that planting is done on already deforested land. Until now, there was a lack of information to distinguish “good” from “bad” plantations. A recent CIFOR study reviewed 400 satellite images of Borneo from 1973-2015 to make that distinction. Wetlands are critical in the fight against climate change, but not enough is known about where these ecosystems are located, or how much area they cover, especially in the tropics. To address this gap, CIFOR and partners launched an online interactive map. Peatland fires in Indonesia push scale-topping figures. Besides the cost of emissions and hectares burned, research is ongoing into the political economy of fire and haze, as well as the health impacts the fires present. In this photo essay, images captured during the peak of the 2015 crisis offer insights into the day-to-day reality for those who lived through the environmental crisis in Central Kalimantan and Eastern Riau. “No Deforestation. No Peat. No Exploitation”: Though simple in their aim, zero deforestation commitments have divided the palm oil sector in terms of which rules – and whose rules – to follow, says CIFOR’s Pablo Pacheco. In Indonesia, the world’s largest producer of palm oil, companies are facing opposition from the government. Since the Paris Agreement on climate change was reached at COP21, the discourse has shifted towards implementation, focusing on the ‘how’, rather than the ‘what’ and ‘why’ of climate action. CIFOR’s Stephen Leonard outlines the Top 10 considerations for ensuring the Agreement’s smooth implementation. Land use today is shaped by an array of forces, ranging from concession authorization to cultural taboos. To find out more, CIFOR’s Anne Larson and Ashwin Ravikumar reviewed hundreds of norms and regulations shaping land-use change in five countries: Peru, Indonesia, Tanzania, Mexico and Vietnam. In the midst of efforts to achieve ‘zero deforestation’, it is important to remember that commitments should involve finding models that work for all stakeholders – public and private – and support smallholders who depend on commodities for their livelihoods. CIFOR’s Pablo Pacheco and Sophia Gynch analyzed the performance of key supply chains in Indonesia and Brazil. Large-scale monoculture plantations have been accused of land–grabbing, forest destruction, unfair distribution of benefits, and so forth. So it might sound counter-intuitive to suggest timber plantations as a prime solution to promote forest conservation. Yet CIFOR’s Romain Pirard urges policymakers to take a closer look. “We want to redefine ‘forestry’ to mean ‘all contributions to sustainable development that are made possible through forests and trees’.” writes CIFOR’s Director General, Peter Holmgren. A new map could present a big step forward for forest conservation. Because satellites only see what is on top of the canopy, they often fail to assess biomass on the ground. 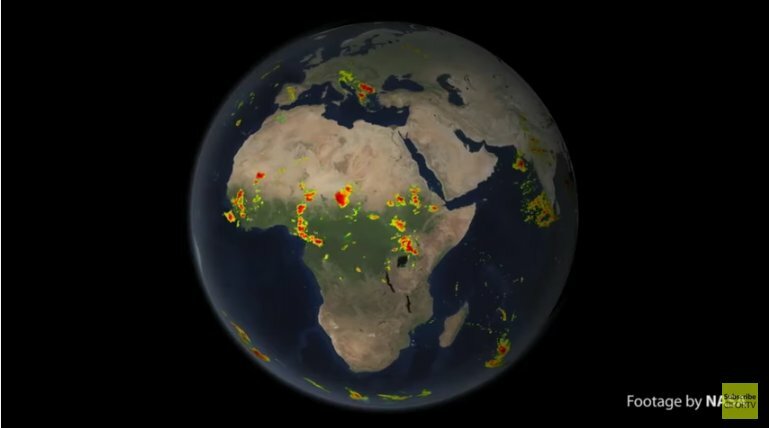 Now, scientists are combining satellite imagery with data from 14,000 ground plots. 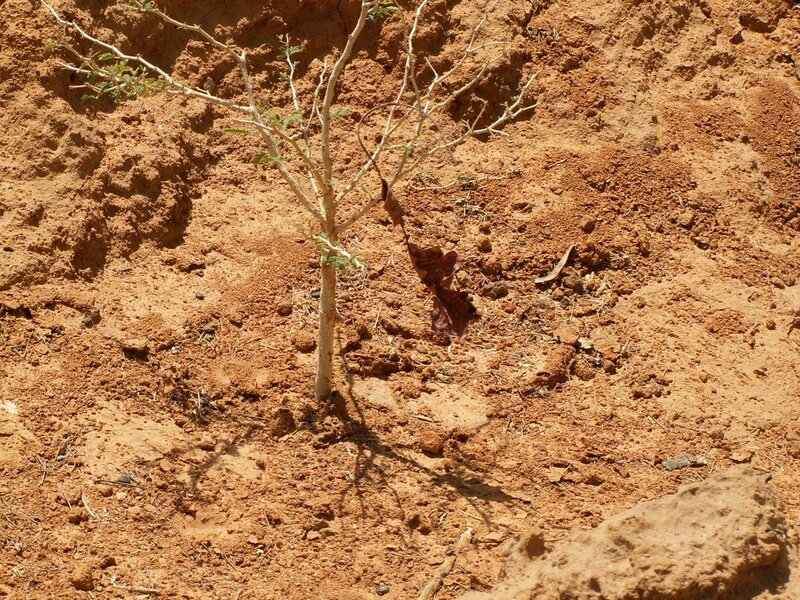 In arid places, the planting of trees is discouraged out of the belief that trees reduce the availability of water. But scientists in Burkina Faso have found that when a certain number of trees are present, the amount of groundwater recharge is actually maximized. New research uses spatially and temporally explicit data to better understand deforestation trends in South America, providing welcome detail for policymakers and others looking to understand a 15-year period (1990-2005) of significant land-use change. Agrarian change happens at the landscape scale, but making the transition to sustainable agriculture requires an understanding of local benefits and trade-offs. A new study examines seven multi-functional landscapes in Ethiopia, Cameroon, Indonesia, Nicaragua, Bangladesh, Zambia and Burkina Faso. Efforts to beat climate change have helped boost capacity to measure forest carbon, according to a new study across 99 tropical countries. More than 300 people, 21 communities, four landscapes and two countries were involved in this groundbreaking study in land tenure in Ecuador and Peru. A sample of indigenous and mestizo communities with a mixture of individual and collective property titles were asked about their forest and natural resource use, and perceptions of land ownership. Get a snapshot of wetlands and blue carbon stocks around the world with this interactive online map. 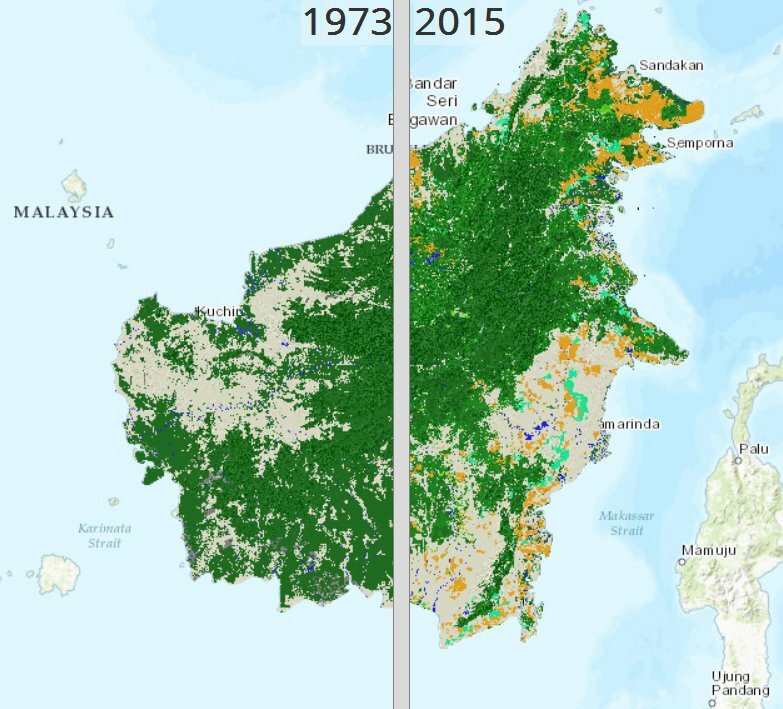 Slide to see how industrial plantation expansion has affected forest cover on the island of Borneo from 1973 to 2015. A comprehensive visual guide to the changing oil-palm industry on the island of Borneo. Join Peter Holmgren, Director General of CIFOR, and Tony Simons, Director General of the World Agroforestry Centre (ICRAF), as they discuss the challenges and opportunities that lie ahead for forests and for our planet. Travel to West Timor, Indonesia, to witness the traditional Mutis-Timau honey harvest. Every year, community members travel great distances back to their sacred homeland when nature signals it is time to collect the honey. Learn how this sustainable forestry practice complements national policy on forest conservation and brings in local income. Join CIFOR’s John Fa as he walks viewers through the concept of bushmeat – the meat of wild animals used by humans for food and other purposes – and the challenges it poses for the sustainability of wildlife and sustainability of livelihoods. Venture into the Columbian Amazon to discover the importance of bushmeat for rural Ticuna families, including its impact on local culture, food security and income. Forest landscape restoration (FLR) is the ongoing process of regaining ecological functionality and enhancing human well-being across deforested or degraded areas. Journey to Ethiopia’s arid north with CIFOR scientists to learn about the Tigray region, which has become an international ‘poster child’ for successful conservation efforts. This presentation, given by CIFOR’s Director General Peter Holmgren, describes how the Center’s strategy steps up to the new Global Development Agenda. This presentation, given at the 53rd Annual Meeting of the Association for Tropical Biology and Conversation, assesses the livelihood impacts of agrarian change across the forest transition in six tropical landscapes in Zambia, Burkina Faso, Cameroon, Ethiopia, Indonesia and Bangladesh. This presentation, given by Ani Nawir, Naya Puadel, Grace Wong and Cecelia Luttrell at the ASFN 6th Conference at Inle Lake, discusses key lessons from community forestry practices in Indonesia and Nepal. This presentation, given by Terry Sunderland at the 2016 PEFC Conference Sustainable Landscapes, Sustainable Livelihoods in Bali, Indonesia, examines the vital links between forests and food security, and how to best operationalize the ‘landscape approach’. REDD+: What Works and What Doesn't? This presentation, delivered at the 3rd Asia-Pacific Forestry Week 2016 in the Philippines, introduces CIFOR’s REDD+ Benefit Sharing Knowledge Tool. Bushmeat stand on the “Bartica” Market. Guyana´s inhabitants, indigenous or from Indian or African origins , hunt and trade wildmeat as a source of food, to generate income or as a traditional hobby. Some of the most traded species are paca (labba, Cuniculus paca), capybara (Hydrochoerus hydrochaeris), peccary (Tayassu pecari) and iguana (Iguana iguana). Photo by Manuel Lopez for Center for International Forestry Research (CIFOR). The Unamat forest, Puerto Maldonado, Madre de Dios, Peru. Photo by Marco Simola for Center for International Forestry Research (CIFOR). 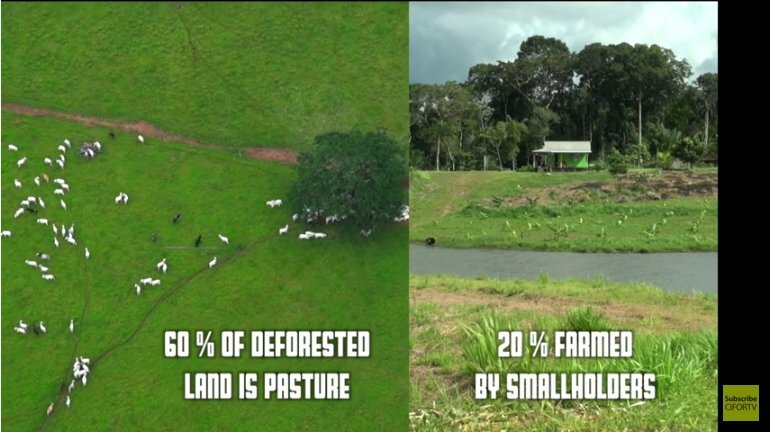 Cattle farming is a major driver of deforestation in Brazil. Landscape near Rio Branco, Acre, Brazil. Photo by Kate Evans for Center for International Forestry Research (CIFOR). The store (Natural Gum Marketing Enterprise in Adama) is managed by the government. This site is only for cleaning and packing for export. Gum is coming from Southern, South Eastern and Western regions of Ethiopia. Regional offices are located within each area, and employ traders to buy the gum. After that, the gum is transported to the storage site in the town of Adama. Each gum is cleaned by hand, sorted by size, and then color. Gum is collected from Acacia (Boswllia Paprifera ) and Acacia Senegal (South East Boswllia Negra). Photo by Ollivier Girard for Center for International Forestry Research (CIFOR). Afforestation patches subsidized by the Conversion of Cropland to Forest Program. 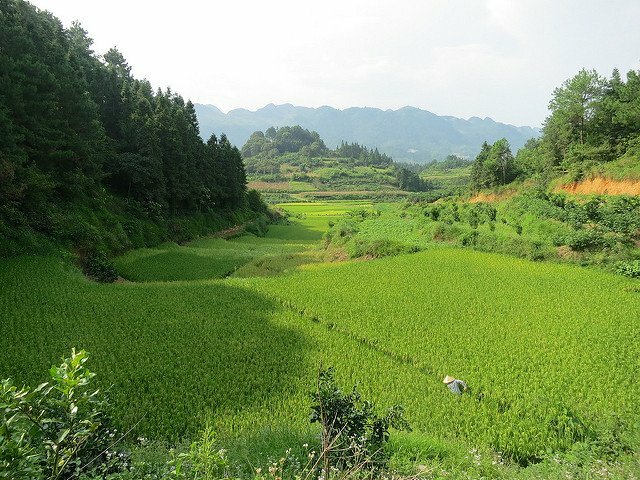 Red Earth Township, Dongquan County, Yunnan Province, China. Xinjiang barley is growing in the foreground. Photo by Louis Putzel for Center for International Forestry Research (CIFOR). A teenager selling his Agouti, on the road between Mahaica and Georgetown. Guyana. Photo by Manuel Lopez for Center for International Forestry Research (CIFOR). The Summit’s 300+ participants brought perspectives from across the region to discuss ways toward a more integrated approach to forests, people and development. Empowering smallholders is essential for economic development — and to protect forests. CIFOR’s Pablo Pacheco spoke on the sidelines of the 2016 Asia-Pacific Rainforest Summit about the need for sustainable investment in smallholders in the region. Asia-Pacific nations are some of the world’s most vulnerable to the effects of global climate change — but also hold some of the greatest potential for climate change mitigation through REDD+. Regional leaders gathered in Brunei Darussalam to discuss ways to slow, halt and reverse deforestation in the Asia-Pacific. But what does it mean to ‘reverse’ deforestation? And how can it be done without reversing the rapid development that supports the economies and livelihoods of the region? An increasing number of states are embracing commitments made under the Paris Agreement to reduce greenhouse gas emissions and limit global temperature rise. But how do these grand ambitions play out in reality? Find more of the best content from the Global Landscapes Forum here. The sixth Global Landscapes Forum in Marrakesh, Morocco, brought together stakeholders from diverse backgrounds to work together on planning climate action for sustainable development. CIFOR’s Director General Peter Holmgren spoke on the sidelines of the Global Landscapes Forum about the landscapes approach, what it means for the global climate agenda, and what’s coming up next for the GLF. The German Ministry for the Environment and the Ministry for Economic Cooperation are working together to support the GLF for the next four years in Bonn. The platform for global action will meet in Bonn for the first time in 2017.